Frank Mahony was born in Melbourne and studied in Sydney at the NSW Academy of Art. He painted Australian genre subjects and was a highly talented and professional illustrator who drew for numerous publications including The Picturesque Atlas of Australasia and The Bulletin. He also illustrated books by Henry Lawson and Banjo Patterson. 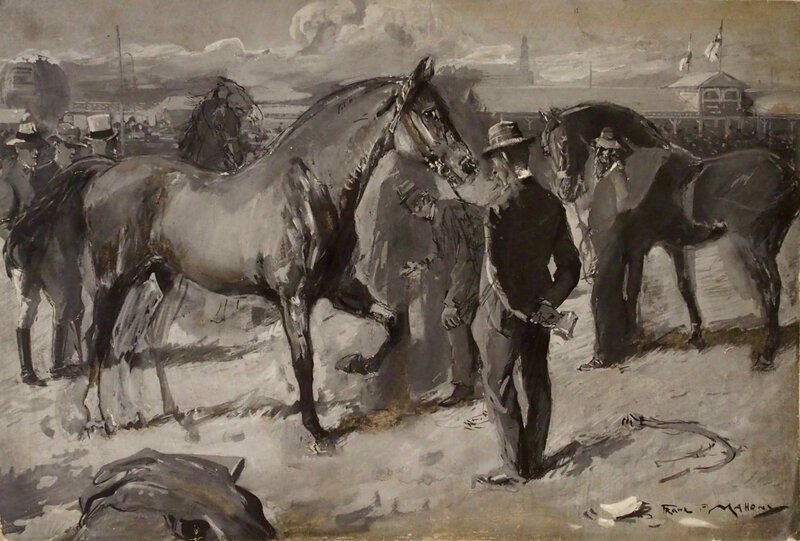 Mahoney also produced a large work titled The A. J. C. Autumn Meeting – The Lawn at Randwick, 1888 (painted with Albert Henry Fullwood – see elsewhere on our website) which was engraved as an insert for The Sydney Mail, Saturday, March 31, 1888. The oil painting At the Races was probably painted at around the same time.